You when it Gets Tough! So, you've made it to this page! You were searching for parenting humor maybe... I hope you are not having one of those hard days when you want to take a break from parenting. One of my answers to a tough day is humor! So, I thought I'd share some humor with you to help lighten your mood. You like this quote or you would like to read more like this? Then click here to view parenting quotes. There was this little boy who had a bad habit of sucking his thumb. His mother finally told him one day that if he didn't stop sucking his thumb, he would get fat. 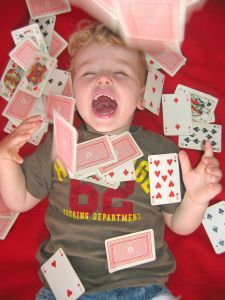 Two weeks later, his mother had some of her friends over for a game of bridge. The little boy points to an obviously pregnant woman and says, "Ah, ha! I know what you've been doing!" Want more jokes? Then, click here for parenting jokes. Or maybe you like quizzes, the serious ones or the silly ones. Click here to go to the parenting quiz page. In any case, I really hope that humor will help to improve your mood today and will help you see how much you love your little ones, as hard as parenting can be some days.